Last Thursday in Khartoum, security forces blockaded neighbourhoods and raided homes to arrest protesters hiding there. Videos posted by activists show security forces going door to door, harshly beating protesters and residents with sticks and gun butts and shooting at protesters. Three died, including 25-year-old Babiker Abdul Hamid, a medical doctor. "You are a medical doctor? We are looking for you," the officers reportedly said before shooting him at close range. The case has become a symbol for the security forces' brazen disregard for hospitals and medical personnel, especially after they said they would treat wounded protesters without charge. Since protests started in mid-December, sparked by price hikes but tapping into a deep reservoir of discontent, the government's forces have shot scores of protesters dead - likely more than the 40 that activists estimated last month - and detained hundreds including doctors and medics. Neither the protesters nor the government's forces look ready to stop. 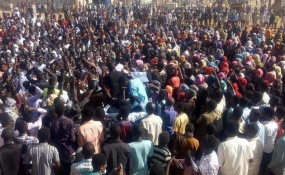 Far from condemning the violations, Sudan's leaders have publicly condoned the violence and sought to justify the security force's actions. On 20 January during a rally in White Nile state, President Omar al-Bashir blamed "infiltrators" for killing Dr Babiker. It is a now-familiar line.On 8 January, in a rare public appearance, former vice president Ali Osman Taha warned opponents of the government that militia "brigades" would defend the country - a statement that recalls the killing of more than 170 protesters during demonstrations in 2013. At the beginning of the protests, national security agents rounded up dozens of Darfuri students, and televised them with visible signs of beatings reading clearly forced confessions. They remain in national security detention - like scores of prominent opposition party members, rights activists, and journalists - without access to lawyers, family or doctors. They have not been charged with any crime. On January 21, in a leaked statement, his first since the protests started, Salah Gosh, the national security director, told the ruling party's doctors union that government forces did not kill the doctor. He blamed the Communists, one of Sudan's oldest opposition parties, which observers read as a standard ploy to unite Islamist constituents. Meanwhile, the authorities have continued to censor and confiscate newspapers covering the protests, and just this week revoked the license for six more journalist working for international outlets including Al Jazeera. He blamed the Communists, one of Sudan's oldest opposition parties, which observers read as a standard ploy to unite Islamist constituents. Meanwhile, the authorities have continued to censor and confiscate newspapers covering the protests, and just this week revoked the license for six more journalists working for international outlets including Al Jazeera. This is hardly the first time Sudanese have taken to the streets. Revolutions in 1964 and 1985 started with protests. Every year since 2011, as neighbouring countries had their Arab springs, Sudanese have protested over a range of issues: Government price-hikes, poor working conditions in the health sector, arbitrary detentions, women's rights, land evictions, and many others. Sudan has consistently responded with excessive and lethal force. In 2013, over 170 were killed in government crackdowns on protests. Al-Bashir, himself still wanted by the International Criminal Court for war crimes, crimes against humanity and genocide in Darfur, announced an investigation committee into the violence on 1 January. This was hardly promising. After all, the government's investigation into the violence in 2013 did not yield credible prosecutions for any of the victims. But as the protests continue, the abuses are accumulating. While the reports have prompted condemnations from various countries and groups including in the US, UK, and Norway, Canada, and the UN's secretary-general and high commissioner for human rights - it is becoming clearer by the day that words are not enough.